Visit to Berlin always included a stop at the Staatliche Museen and every visit to the Antikenmuseum includes a stop at the Berlin F 2160 Vase, as it is officially named. 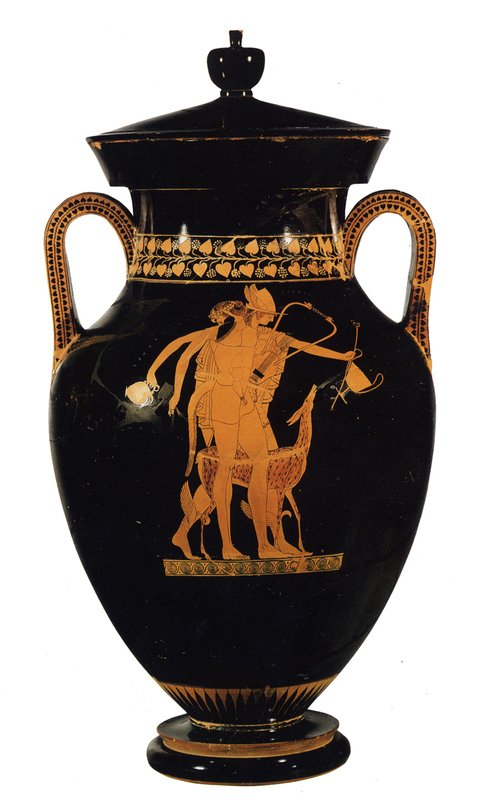 This 27 inch tall red-figure amphora portrays Hermes and a satyr on one side and a lone satyr on the reverse. Hermes holds a oinochoe (a wine jug) in his right hand and a kantharos and caduceus* in this left hand. A kantharos is a cup used to hold wine for drinking or for ritual use and is associated with Dionysus; moreover, it provides a clue to the story being told. 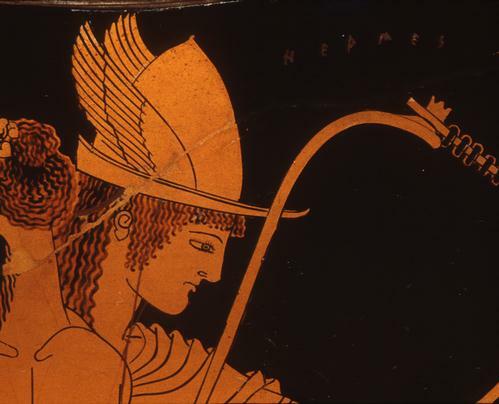 Hermes is dressed in a short tunic and chlamys (a short, fine woolen mantle), and wears a winged cap and winged boots. 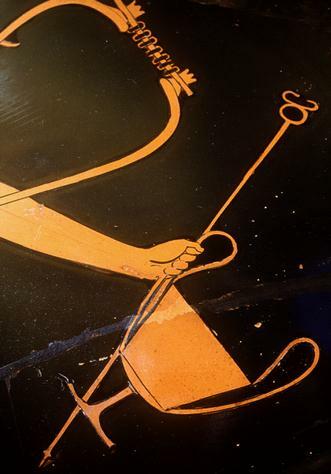 In front of Hermes is a satyr (named Oreimachos) holding barbiton (a type of lyre) his fingers splayed across the strings. In his other hand, held out behind him, he holds the end of a string attached to the lyre. He has a long beard and wears a wreath, and his right leg is shown in three-quarters view. Hermes is striding ahead, while the satyr has paused to look back, perhaps at the other satyr on the reverse of the vase. Between the two figures is a fawn, its head raised skyward. The three figures are gracefully superimposed on one another, forming a unified island against the black background of the vase. Above the scene is a band of ivy leaves and grape bunches. Below the figures, forming a groundline, is a running spiral, a rare ornament in Attic Red Figure vase paintings. Obverse. A satyr (named Orochares) holds a large kantharos and a lyre. The kantharos is raised to his lips, while he holds the lyre at his side, his fingers touching the stings. His long hair is tied at his neck and he wears a wreath. There are no painter signatures on any of the Berlin Painter's attributed works, so he was assigned this name. 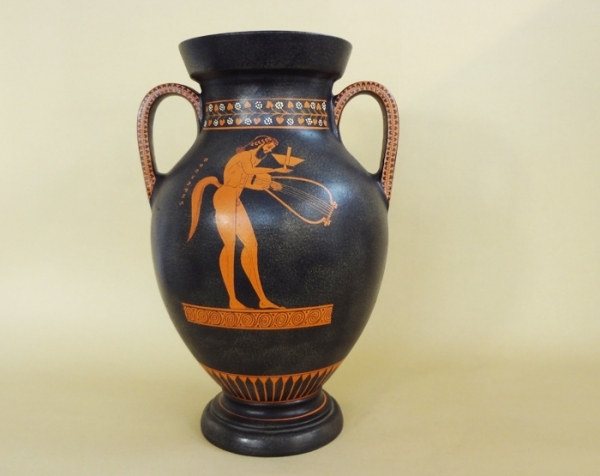 He began working in Athens in the Late Archaic style and was instrumental in the development of the Classic style of Attic Red-figure pottery His painted figures are usually isolated or paired without framing devices against a glossy black ground. These figures are elegant, dignified, and show a gentleness in the relationship between the figures, even the fawn. The vase was exported in antiquity to northern Italy and was recovered in 1834 at Vulci, an Etruscan city in the Province of Viterbo, north or Rome. The majority of his works have been found in Italy, suggesting they were created for export to the Italian market. Many were preserved as grave goods in the necropoli of Vulci, Nola, and Locri. The Vulci were a tribe of people as well as a city. The Etruscans were assimilated into Rome and Vulci was abandoned. *Apollo gave Hermes the caduceus as a gesture of friendship. It has magical powers.